AltaSea Open House - CO2: What to do?? Name: AltaSea Open House - CO2: What to do?? 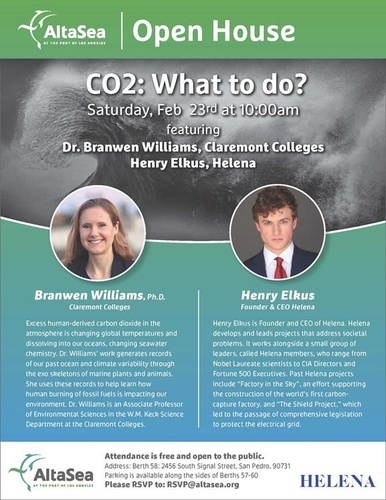 Please join us as our featured speakers, Dr. Branwen Williams, Claremont Colleges professor and Henry Elkus, Helena's Founder and CEO, describe how CO2 is impacting our environment and what is being done to counteract the damage. Our partners will be on hand to discuss how their work is benefitting our community.